Reports of tremors stretched across 350 miles from Washington, D.C. to New York City. 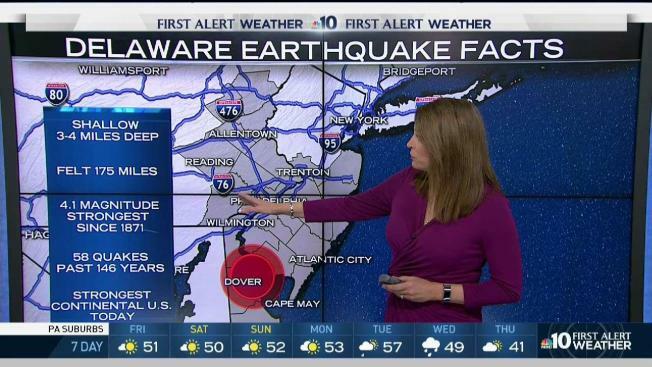 NBC10 First Alert Weather chief meteorologist Tammie Souza looks at the facts of the Delaware earthquake. Thursday’s 4.1 magnitude earthquake near Dover was the strongest to strike Delaware in at least 146 years. On Oct. 9, 1871 it is estimated that a quake of the same magnitude caused extensive damage in Wilmington and surrounding communities. In fact a 3.8-magnitude quake in 1973 was the largest officially recorded earthquake in Delaware prior to Friday and there have only been 58 earthquakes located in Delaware since 1871. This quake was shallow with a depth of about 5 miles beneath the surface allowing for the shock waves to be felt farther away than they would be with a deeper quake. Reports of tremors stretched across 350 miles from Washington, D.C. to New York City. 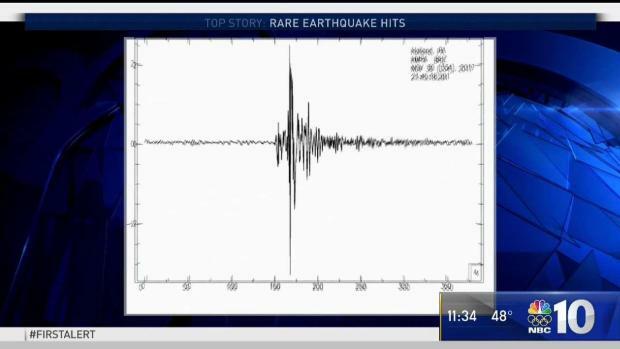 Residents through several states said they felt the rare earthquake in Delaware. NBC10s Aaron Baskerville reports. Dover’s quake was also the strongest to strike the Continental United States Friday. Hours later, a 4.2 quake was felt in Alaska. Delaware is considered a medium seismic risk state by the U.S. Geological Survey (USGS) and the Federal Emergency Management Agency (FEMA). The higher you are in a home or building the more likely you are to feel the earthquake and the more intense the tremor will feel. The strength of an earthquake is measured in magnitude. Today’s quake was a 4.1. If it had been a 6.1 it would have been 100 times stronger and if it had been a 5.1 it would have been 10 times stronger. Of the estimated 3,000,000 earthquakes around the globe each year only 2 percent are greater than a magnitude 3.0 and only 10 to 20 reach the major status of 7.0 or greater. - (4) Felt indoors by many, outdoors by few during the day. At night, some awakened. Dishes, windows, doors disturbed; walls make cracking sound. Sensation like heavy truck striking building. Standing motor cars rocked noticeably. - (5) Felt by nearly everyone; many awakened. Some dishes, windows broken. Unstable objects overturned. Pendulum clocks may stop. 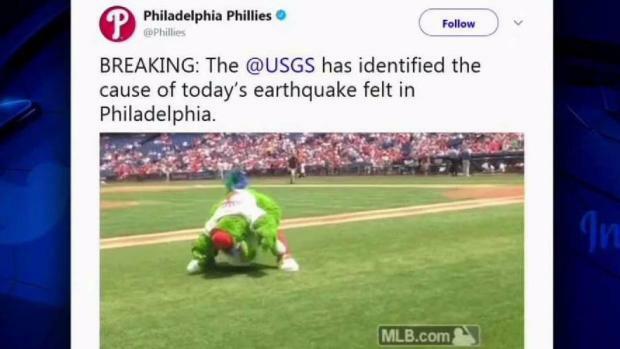 NBC10's Katy Zachry is following the impacts of Thursday's earthquake and how people in our area are reacting, including the Philadelphia Phillies having some fun thnaks to the Phanatic.